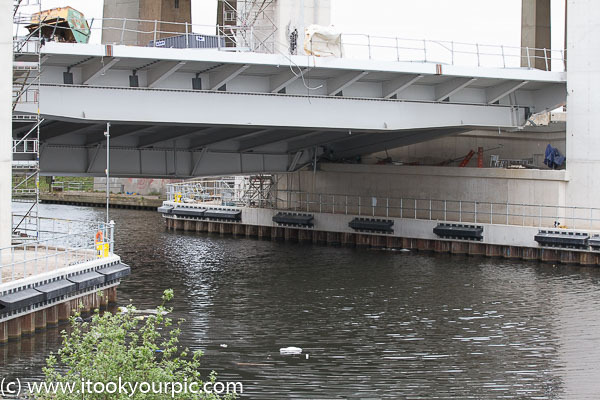 The partial collapse of a new bridge at Barton in Salford this morning was so loud it felt like a bomb had gone off, workers have told SalfordOnline.com. 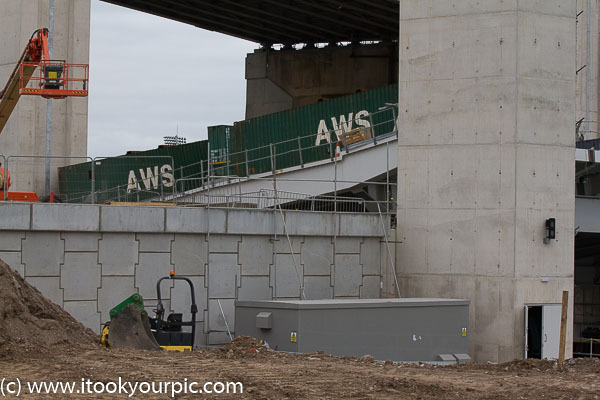 Emergency services were called to the building site, underneath the Barton High Level Bridge near Junction 11 of the M60, at 9.35 this morning, Monday 16 May. One contractor, 24-year-old James O’Rourke, who is working on a neighbouring site near the Chill Factore indoor ski slope said: “It felt like an explosion. Deep gouges have appeared in each of the 90ft pillars which make up the lifting bridge. 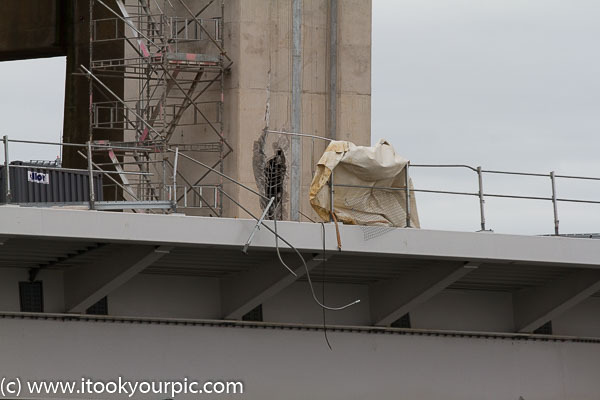 Part of the metal railing around the concrete platform is also bent and buckled. Video shot by community videographer Phil Hogan shows the extent of the damage. When SalfordOnline.com arrived on site this morning – along with BBC North West Tonight and ITV – work had not yet come to a halt. It’s thought a platform weighing in excess of 100 tonnes was being held in place by winching cables when it came loose and started to fall down. It appears that safety cables slowed the platform’s descent so it didn’t hit the concrete platform full-on, but rather scraped down the sides of the four concrete pillars and crashing into a metal barrier. “Earlier today they were winching Portakabins and there was blokes standing on top of them. “They’re just lucky no-one was killed. 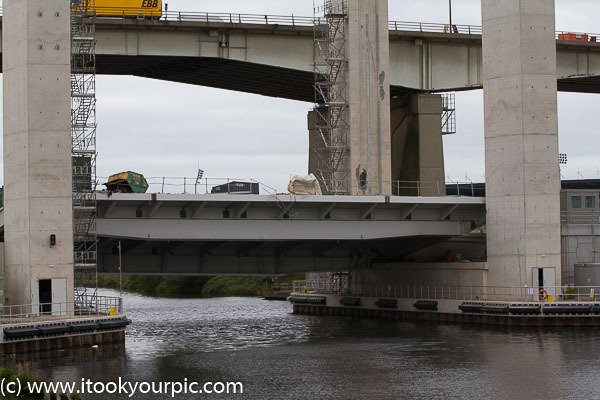 The £1.1m vertical lift bridge is being built by Hochtief UK as part of the Port Salford project, allowing large ships to travel down the Manchester Ship Canal and drop off freight at the new joint road, rail and canal terminal. Work started in May 2015 and was expected to be completed by the second half of 2016. The location is between the Salford Red Devils’ ground at the AJ Bell Stadium and the Trafford Quays Leisure Village, which houses Airkix and Chill Factore. The £30m Western Gateway Infrastructure Project will eventually provide a new road linking with the A57 Liverpool Road to cut traffic congestion, as well as new traffic flow at the motorway roundabout at Junction 11. This drone footage, posted to Youtube by NorthPorts shows the building work ongoing at the lifting bridge. No-one was hurt in the incident, Greater Manchester Police confirmed. As of 11.15am on Monday morning police had all but left the scene but one car remained on site for monitoring purposes. A spokesperson for the North West office of the Health and Safety Executive said the contractors would have 10 days to report the matter to authorities as no-one had been injured on site. Love at 3,000ft: Is this Salford’s most ambitious ever wedding proposal?